The booklets produced by the BABNC that were comb perforated 12.5 x 12 (actually 12.4 x 11.9 according to McCann). The transition from dextrose gum to PVA, and different forms of PVA gum used on the panes. The covers were re-designed for the 25c and $1 booklets. A new experimental 50c booklet was produced. Significant differences in paper fluorescence are found on nearly all of the booklets printed by the BABNC. This post will discuss all of these changes in detail as part of my coverage of all significant aspects of these booklets. Except for the OPAL booklet, all of these booklets exist with a large oblong counting mark along the spine of every 50th booklet printed. The counting mark is printed in the same colour as the text on the cover of the booklet. 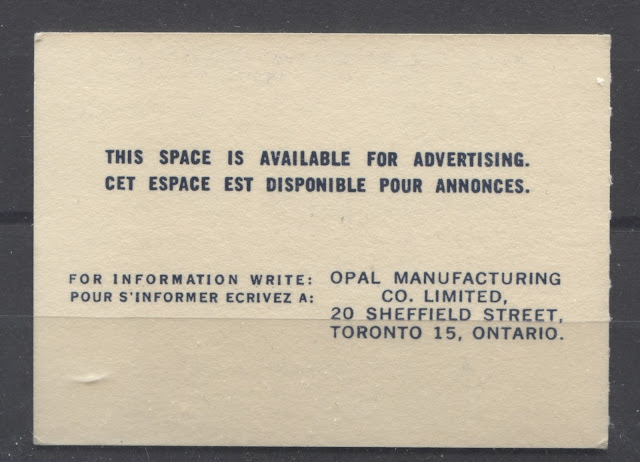 In October 1970, the Opal Manufacturing Co., located in Toronto was contracted to produce a private vending machine booklet that would sell for 25c. It contained only 3c and 2c stamps, up to face value of 20c, so it sold for a whopping 5c over face. For that reason I expect that it would have been highly unpopular with the public. The configuration of the stamps was not a problem, because the 5c, 6c and 7c rates could be easily made up using combinations of the stamps contained therein. 2,200,000 booklets were issued. 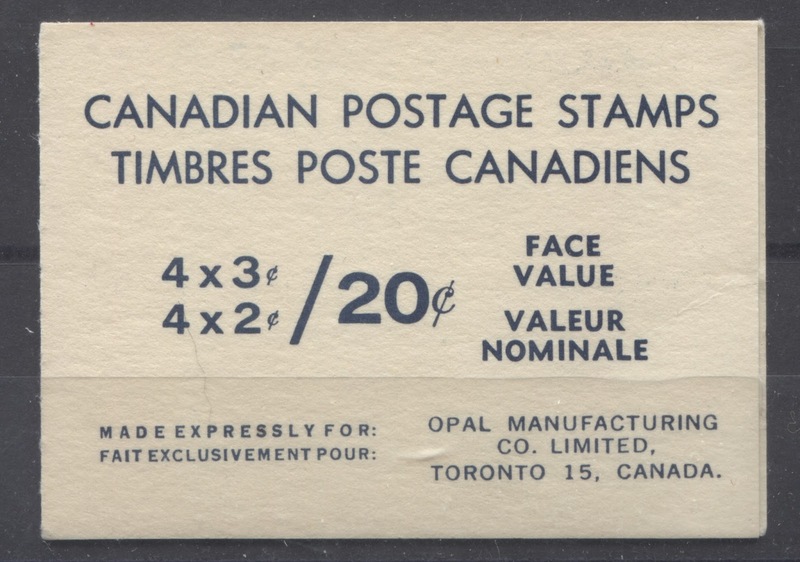 Apart from the first two stapled booklets, this was the only other booklet from the series to be produced by the Canadian Bank Note Company, as well as the only integral booklet to be produced by them. This is also the only integral booklet that does not exist with a counting mark on the cover. The back cover. 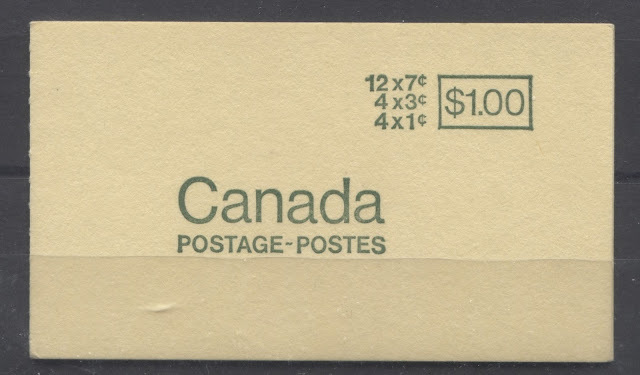 Interestingly, there never was any advertising on any version of this booklet, or any other booklet since, that did not have to do directly with Canada Post. The spine of the cover is perforated, as is visible at the right in the above scan. The covers generally give a dull fluorescent greyish cream glow under the UV light. The booklet contained one large pane of 8 stamps separated by a gutter that was folded horizontally, just past the middle. At the top of the pane was a block of 4 of the 2c green and at the bottom of the pane, beneath the gutter, was a block of 4 of the 3c purple. The panes were usually sealed at the end, with a glob of adhesive, which usually leaves a thin spot in the top selvage of the pane when the booklet is opened. However, I have found examples of this booklet, which I think may be philatelic, in which there is no trace of any adhesive, or other sealant. A typical booklet with the clear glob or adhesive at the top of the booklet. Of the total number of booklets produced, 226,000 of these were perforated horizontally in the gutter where the fold is. These are very scarce and highly sought after by specialist collectors. However, this variety has been very widely faked by adding in fraudulent perforations. One very easy way to spot this is that the perfs. are often in the wrong place: in the middle of the gutter, rather than where the fold is, off centre, as they should be. In addition, the perfs. will often not be the 11.9 line that it should be. An example of the booklet, showing no trace of sealing glue. These booklets were printed on a special vertical wove paper, that was glazed on the front with a coating that would give a very bright glow under UV light. Unitrade and McCann classify it has hibrite paper, which most booklets that I have looked at are, but I have also seen several that are more high fluorescent, than hibrite. The gum found on these booklets is a smooth, yellow, even dextrine gum with a semi-gloss sheen that shows no streaks. The paper of the panes often shows clear vertical ribbing on the gum side, but is smooth on the front. In December 1970, the booklet of 25 that contained the 6c black die 1 perf. 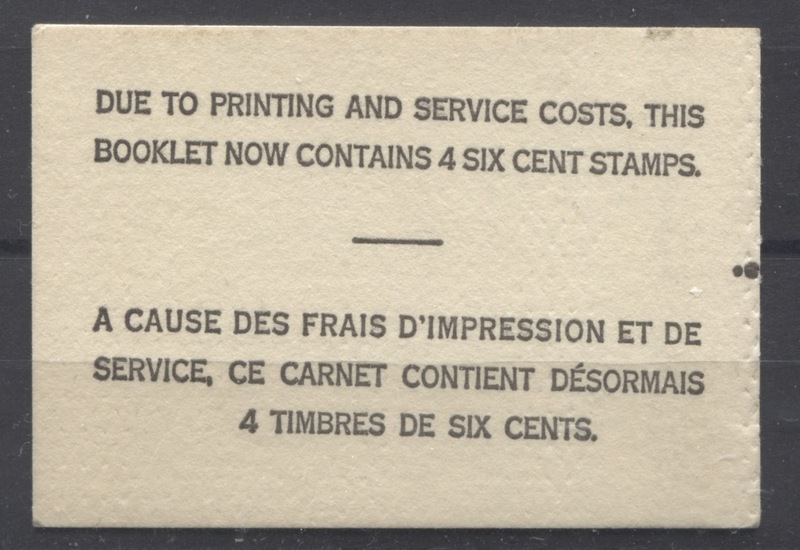 10, was replaced by an identical booklet that now contained the 6c black die 1, perf. 12.5 x 12. It is identical in all respects to the perf. 10 booklet, except for the perforation. A cutting error does exist on this booklet, in which the labels on the top row appear to the right of the stamp, instead of on the left. This was discovered by Doug Karns and I had mistakenly identified this in my last post, as having occurred on the 4c booklet of 25, rather than this booklet. 14,070,000 booklets were issued. The front and back covers, which have the same design as the earlier booklet containing the 6c black and 6c orange. The complete pane inside the booklet. The plate flaws found on the other large 6c booklets, being the mole on the lip or nose, and the vertical scratches across the sixth row, also exist on this pane as well. The cover is generally found in the rough cream stock, and the printing on the cover is always slightly coarse. The panes are generally found printed on either dull paper, or medium fluorescent paper, which usually contains fluorescent fibres. One containing a pane with dextrose gum, and wax on the inside covers. One containing a pane with PVA gum and wax on the inside covers. One containing a pane with PVA gum and no wax on the inside covers. The PVA gum used on this booklet is white and has a semi-gloss sheen, being almost as shiny as dextrose gum. May 1970 is, as far as I know, the earliest date on which any stamp product appears with this type of gum. It is possible though, that the PVA gum examples were produced towards the end of the print run, just before the new combination booklets were produced to replace them. The paper used to print the panes is generally a smooth, vertical wove that gives a dull fluorescent greyish reaction under UV light. The back cover, showing the text printed on a slight slant, which is quite noticeable. The printing is generally fairly clear, but is not fine. It is about half way between the fine print found on the early printings of the perf. 10 booklets, and the coarse printing of the later ones. I have not seen any obvious variation in the size or spacing of the text on either the front, or back covers, but a focused study of these may turn up one or two interesting varieties. The inside of the booklet. This one is the unwaxed cover, and shows the two rectangular cutting guidelines that are commonly found on the BABNC booklets that were printed from 1970 onwards. 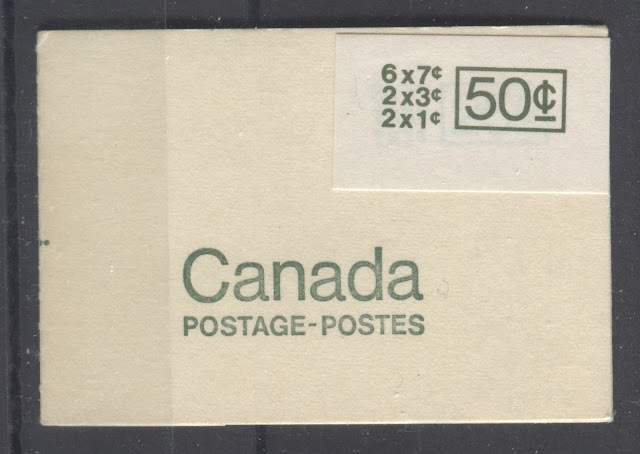 In June 1971, the booklet of 4 6c stamps had to be replaced because the first class postage rate increased from 6 cents to 7 cents, making the 6c booklet more or less useless. The resulting booklet now contained three 7c stamps, and one each of the 1c and 3c stamps, plus a printed label to make up a pane of 6 stamps lais out in a 2 x 3 configuration. The label read, in bilingual text "Apartment numbers are important", and the label always appeared to the left of the top stamp. So far as I know, there have never been any discoveries of cutting errors on this booklet that have resulted in the label being on the right, instead of on the left. A total of 8,660,000 booklets were issued between June 30, 1971 and December 30. The cover is a rough textured cream coloured card stock, which always gives a dull fluorescent, greyish cream coloured glow under UV light. The design is similar to the last booklet, except that "Canada" is now in much smaller font, and instead of the value being white on a coloured box, the value is printed in colour on a colourless box. 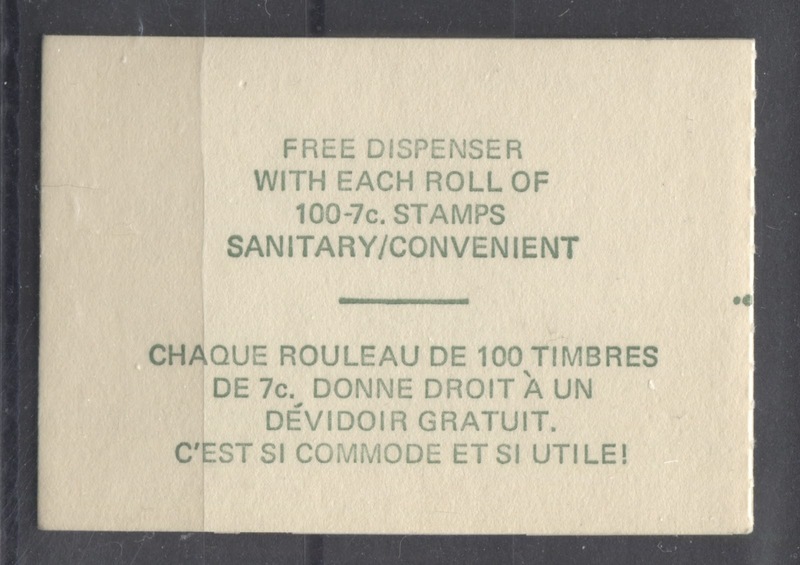 One read: Free dispenser with each roll of 100 7c stamps. Sanitary/convenient. McCann refers to this as Type 1. The other read: Pre-stamped envelopes. A bargain, and no stamps to lick. Ask at your post office. McCann refers to this as type 2. Free Dispenser - Type 1. 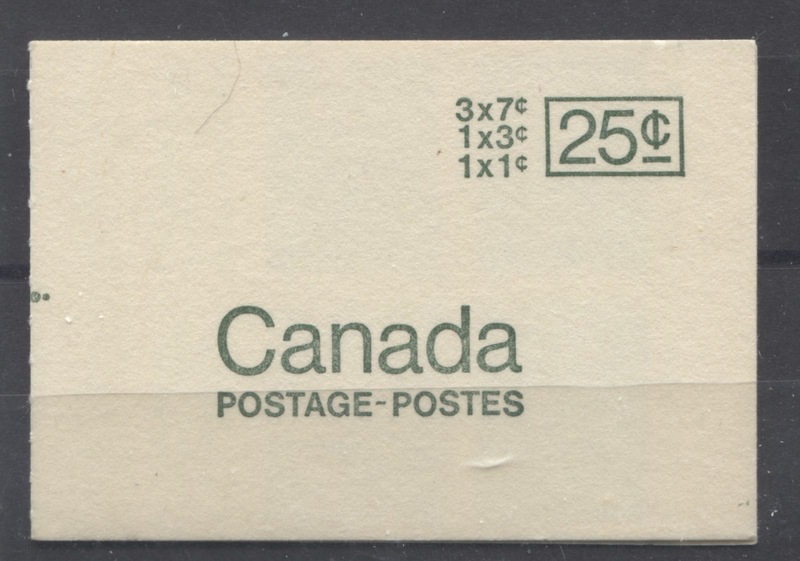 Pre-Stamped Envelopes - Type 2. The inside of the booklet showing the pane of 6. As with all BABNC booklets after 1970, this one has two rectangular cutting guides in the tab. In this case, they are printed in dark brown, the colour of the 1c stamp. The make up stamps included were chosen to be a 3c and 1c because this allowed the user to mail a domestic letter and a letter or postcard to the US (10c rate), and when the rates increased to 8c, they could even use the 1c stamp to make up the rate. They could also use the 1c and two 7c stamps to pay the foreign airmail rate. The gum on these booklets is a creamy, off-white PVA that has a satin sheen. Occasionally there are small bumps that can be found in the gum as well, which some specialists have referred to as stippled or grainy. These are not inclusions, but rather result from the small depressions that are often found in the paper. The panes are generally printed on a creamy vertical wove paper, that shows clear vertical ribbing from the front, in most, if not all cases. The fluorescence of this paper varies quite considerably from dull to medium fluorescent with quite a dense concentration of both fluorescent fibres and brownish woodpulp fibres being visible in the paper. The low fluorescent paper is the most common, and the dull paper is the scarcest. Finally, the 7c stamps can be found in a shade of deep emerald green, as shown above, and a much duller green. Unfortunately, I do not have an example of the dull green at the moment, but will add a scan of one when I can. In addition to different cover slogans, different sealing strips are found on these as well. Both Unitrade and McCann refer to clear sealing strips and black sealing strips, but within these distinctions, there are collectible variations as well. 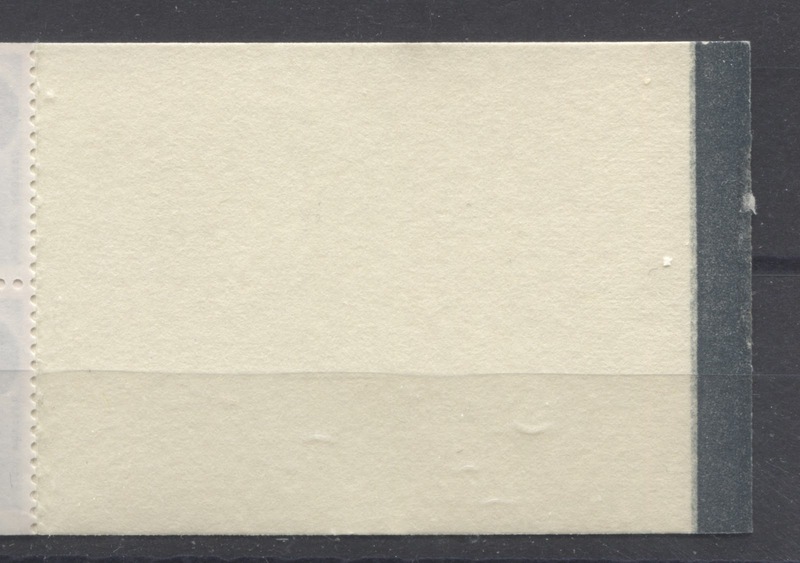 The so called clear sealing strips found on these booklets, which McCann, refers to as "a" types, so that when combined with the covers are type 1a and type 2a, are almost invisible. They consist only of a small bead of rubber cement spread along the wax coating of both sides of the cover. As a result, most booklets usually open without any damage to the cover. Later, the clear sealing strip was actually a band of clear adhesive spread onto an unwaxed cover. Over time, this adhesive has browned, resulting in sealing strips that look very different to those found on these booklets. Free dispenser, clear seal - McCann type 1a. Free dispenser, black seal - McCann type 1b. Pre-stamped, clear seal - McCann type 2a. 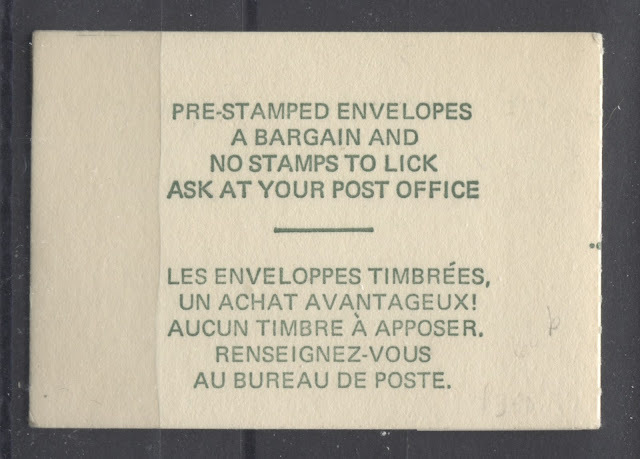 Pre-stamped, black seal - McCann type 2b. Theoretically, it should be possible to find all four types, with three levels of fluorescence, two different green shades and with and without counting marks. All of these permutations should result in 4 x 3 x 2 x 2 = 48 different collectible booklets. So far McCann only lists 15 of these, while Unitrade lists 10, with a general note about counting marks, taking this up to 20. Large sticker on dull paper 33 mm x 19 mm. Large sticker on glossy paper 33 mm x 19 mm. Small sticker on glossy paper 28 mm x 14 mm. Of the 18,000 booklets, 8,000 were produced using small stickers, while the remaining 10,000 were produced using the large sticker. It is not generally known what the breakdown of the 10,000 is between the glossy and dull stickers for the large format, though glossy would appear to be the scarcer of these two types. At any rate, 18,000 is a staggeringly low issue quantity. In my opinion, at an average value between $25-$35 each, these booklets are some of the most undervalued items in all of modern Canadian philately. Both cover types are found, but only with the clear sealing strip according to McCann. In actual fact, all of the booklets that I examined showed no evidence at all of having ever being sealed. McCann lists both types 1a and 2a, with each type of sticker, for a total of six basic booklets, and 12 if you include the counter booklets. However, his catalogue does not list any paper fluorescence varieties, not does it list any shade varieties. However, everything that I said for the 25c booklets indicates that these varieties should exist, and in fact, with two different panes used in each booklet, and in a different order, there should be at least 48 x 3 x 2 = 288 potentially different booklets in existence, though I imagine that by now there will be many cover/paper/sticker combinations that will not exist any longer, almost 50 years after they were issued. The scans below show a typical front cover with a large sticker on dull paper, and the inside appearance of a typical booklet. The front cover with a large, dull sticker. The inside of the booklet showing the two overlapping panes. Both of these are the deep emerald green shade. However, I have seen booklets where both panes are the duller green, and others in which one pane is the deep emerald, and the second pane is the duller green. 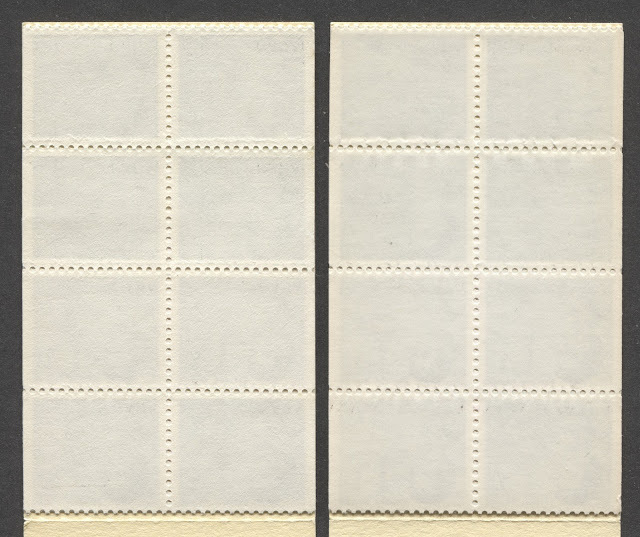 The paper and gum characteristics of these panes are identical to the earlier 25c booklets. The panes are ordinarily both attached on the back of the front cover, with the top pane simply being affixed to the top end of the cover, which makes sense as it was added after the fact. However, I have come across examples of this booklet in which the bottom pane is attached to the inside of the back cover, rather than the front. 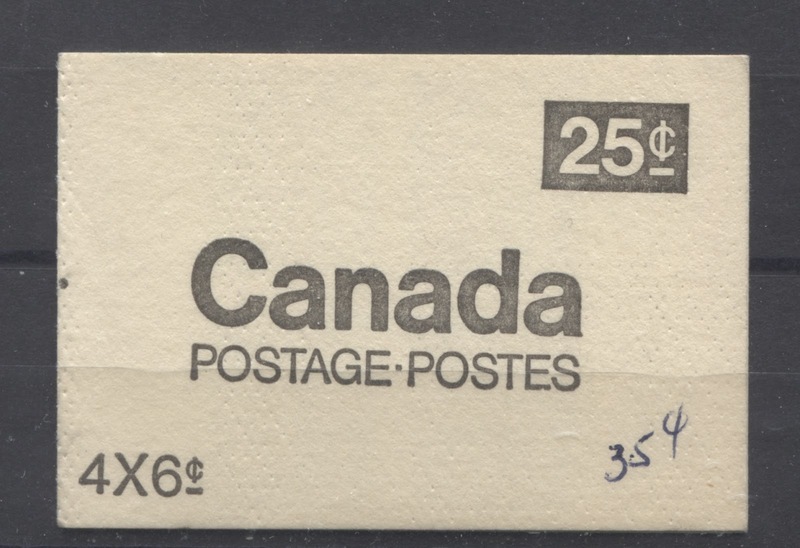 By June 30, 1971, when the postage rate increased from 6c to 7c, it was decided not to continue with the booklets of 25, as the selling price would have to be $1.75 - an amount that the post office felt was too odd for the public to stomach, though I can't imagine why. So it was decided instead to produce a $1 booklet, which would simply quadruple the number of stamps, denomination-for-denomination, that were contained in the 25c booklets. a total of 468,000 booklets were issued. The cover design was very similar to the 25c booklet, except that the card stock was more of a deep yellow than a cream. The card stock was rough on all the booklets I have examined, though it is possible that they may exist on dimpled stock as well. 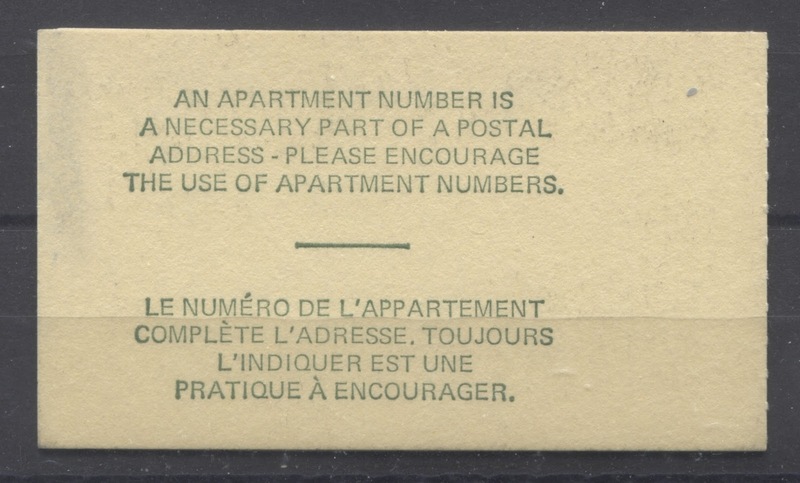 The bilingual message on the back cover was changed to read: "An apartment is a necessary part of an address - please encourage the use of apartment numbers." Under UV light, the covers give a dull fluorescent greyish yellow reaction. The pane of 20 stamps. 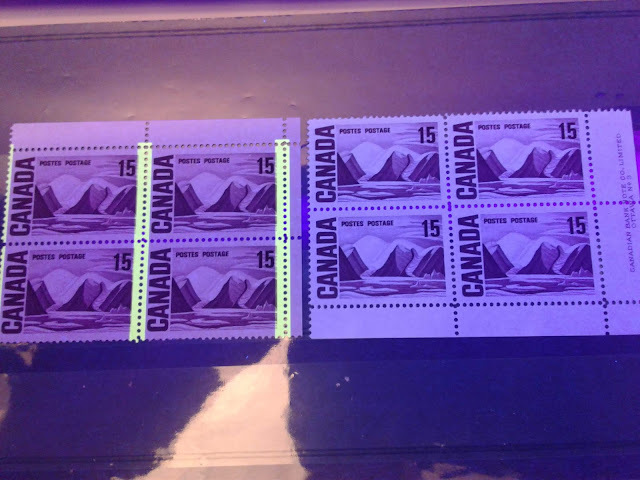 The paper used to print these stamps is a smooth, horizontal wove paper, with no ribbing, and giving a dull fluorescent greyish reaction under UV light. As far as I am aware, all of the panes that I have seen have the 7c printed in a shade of deep emerald green. A very crackly gum, which is colourless, but appears to have a satin sheen because of the fine cracks. A smooth and very glossy gum that has what appear to be fine horizontal strokes in it. The glossy gum is shown on the right, while the crackly gum is shown on the left. The horizontal strokes do not show up in the scan here, but hopefully you can see that the gum on the left is clearly less glossy than the gum on the right. This brings me to the end of my discussion of the integral booklets issued up to June 30, 1971. This now leaves us with only the 25c, 50c booklets and $1 booklets containing the 8c, which were issued between December 30, 1971 and August 1972. I will discuss these in my next post, which will be published on January 2, 2018. Happy holidays to all of my readers, and spend plenty of time with your stamps!